A church similar to the one to be built. When Camille Butner and her brother, Carl Nichols, were in the process of settling their parents’ estate, they came up with a unique idea to donate the money. Carl, who lives in Mooresville, has been involved in mission work in Honduras since 1992. Either this summer or next summer, he will join a team there to build a church in memory of his and Camille’s parents, Jim and Daisy Nichols. Jim and Daisy died a year and four months apart — Daisy in March 2016 and Jim in July 2017. Carl, who spent his career with Duke Energy, does mission work through the Honduran Evangelistic Association. This group serves the Chorti Indians, an indigenous people in Honduras. 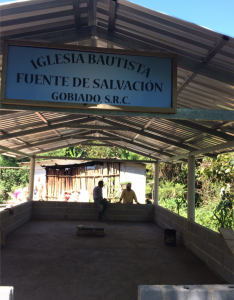 The church they will build is much like a picnic shelter, with concrete floors and pillars, a metal roof, and rows of concrete blocks around the perimeter. To qualify for a church, a village must be holding ongoing worship services and have a worship leader who agrees to take training.